London Design Festival – a pleasure every year, so many shows, exhibitions and events to go to. 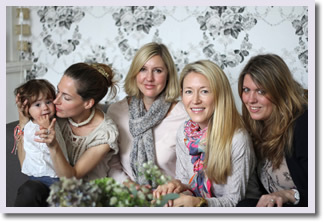 I love to catch up with people I’ve worked with before, design companies and designer/makers that I know from previous shows or whose products I have used in photo shoots. With my book deadline to meet followed by a photo shoot for a client I didn’t make it to as many shows as I would like to this year, but what I did see was great. There is always so much to see and do all over London. First stop was the Tent London show at the Truman Brewery to wander round with lovely Elisa Rathje. It was really good this year, lots of interesting products and creative thinking from smaller design companies. In the afternoon we headed to Origin – the contemporary craft fair and met up with my friends Holly Becker and Leslie Shewring who were over from Germany and Canada to enjoy the shows for the first time. I only took a few photos (with the exhibitor’s permission) of things that caught my eye but thought I’d share them. I would have taken a lot more but I was too busy chatting, having fun and enjoying all the work! 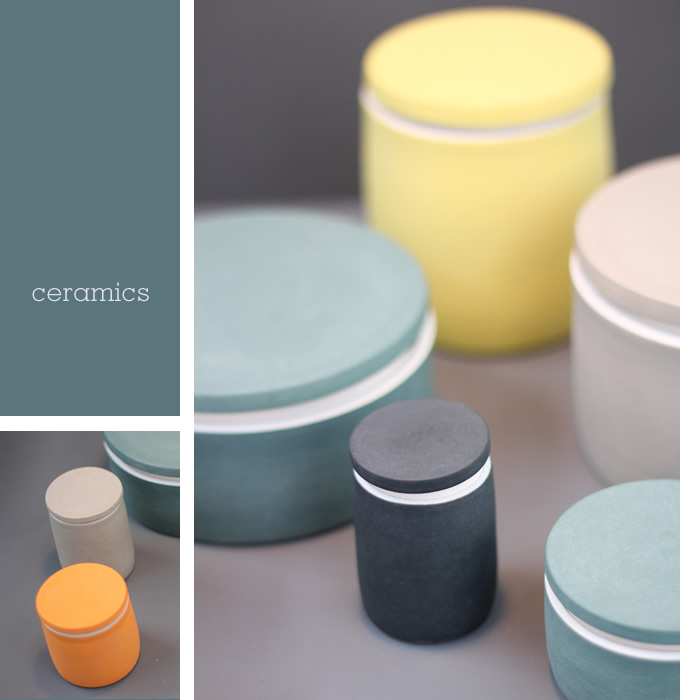 I loved the colours and simplicity of the ceramics above, they’re by Belfast-based Derek Wilson. 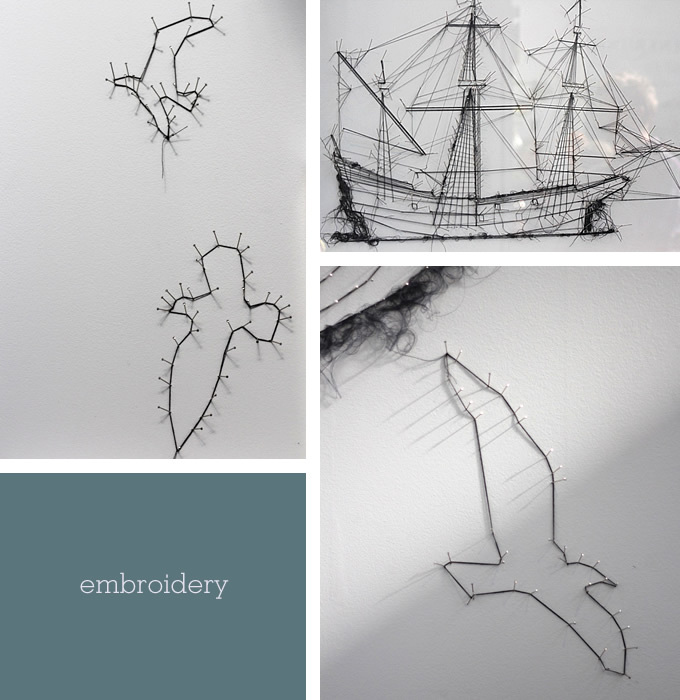 It was great to catch up with textile artist Debbie Smyth whose thread drawings I love (above). I first met Debbie in 2008 when I bought some of her work from her at the New Designers graduate show. It’s great to see her doing so well. 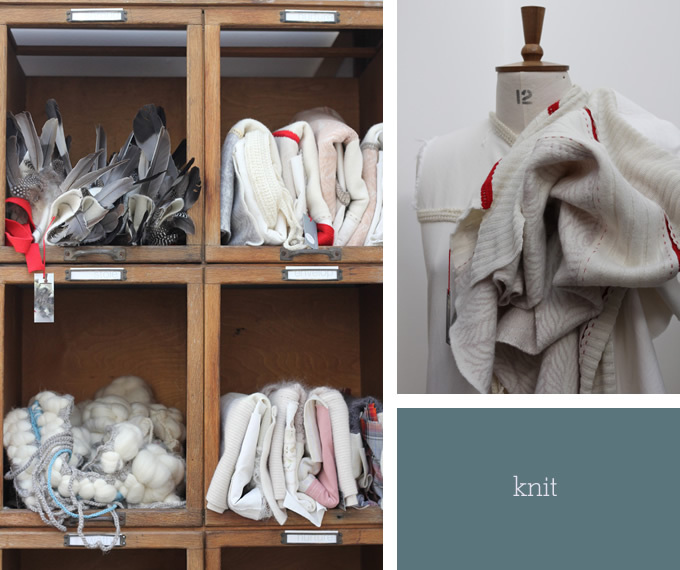 Loved these handmade, wool knitted textiles by Stephanie Wooster. This silver jewellery by Amy Keeper caught my attention too. 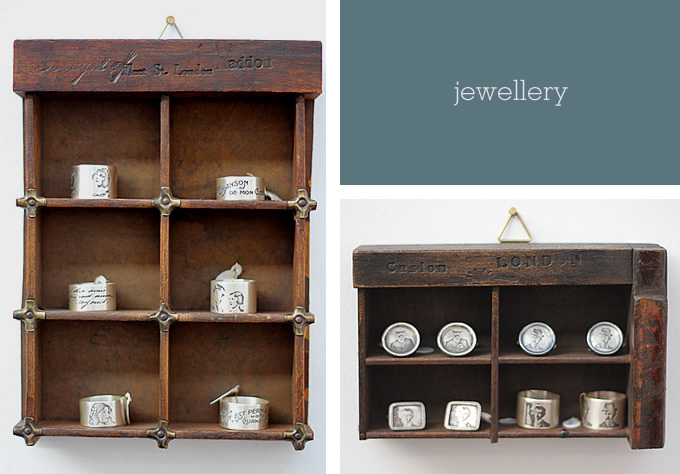 It has a vintage feel and is etched with antique photos and text and looked great displayed in old printers’ trays. The next day we headed to the much larger commercial interiors and design show 100% Design at Earls Court, where the big international names have their stands. An interesting contrast against Tent and Origin and it’s always good to see the bigger interiors picture. On Sunday we popped in to see jewellery designer/maker Emma Cassi to stock up on lovely goodies then headed to Chelsea and one of my favourite stores Anthropologie where Holly and Leslie were hosting a talk on creating mood boards as part of Holly’s Decorate book tour, along with fab interior designer Abigail Ahern. And finally a quick whizz around the Saatchi Gallery with the family afterwards for a contemporary art fix just to round things off! It was a very busy few days in London. So much great work and such fun enjoying it all with good friends. I can’t wait until next year! 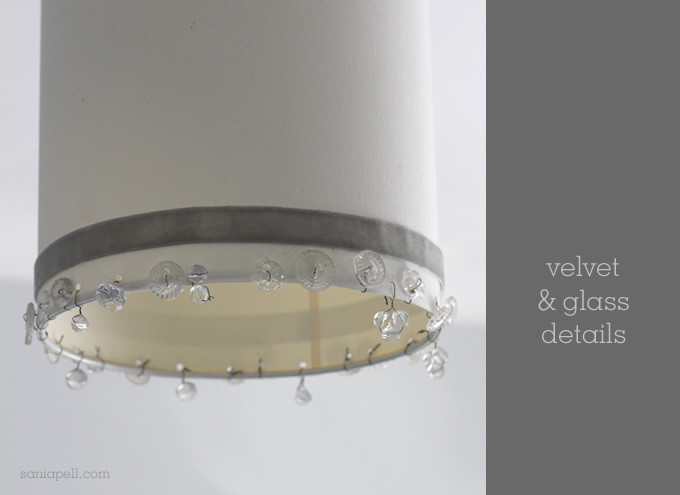 This lampshade hangs in my bedroom and is a little idea to update a plain shade into something special. It is a simple, cylindrical white linen shade that I bought from John Lewis. 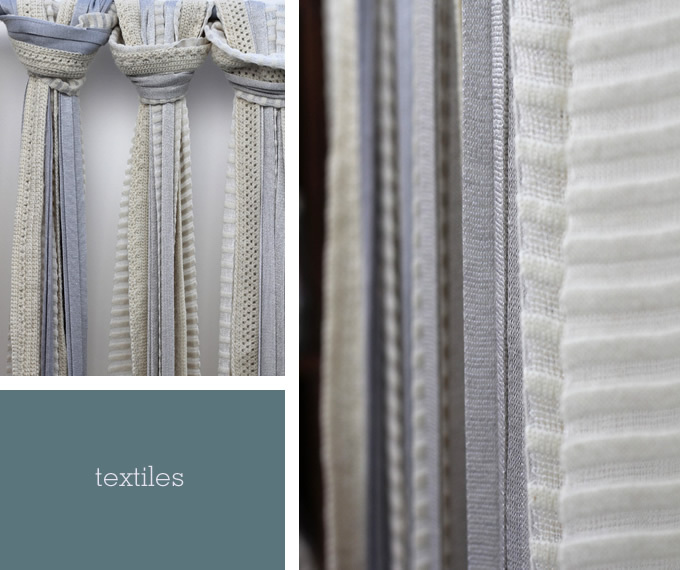 I simply added a stripe of dove grey velvet ribbon, chosen to match the Fired Earth Graphite painted wall behind and help it look more considered in the overall room scheme. 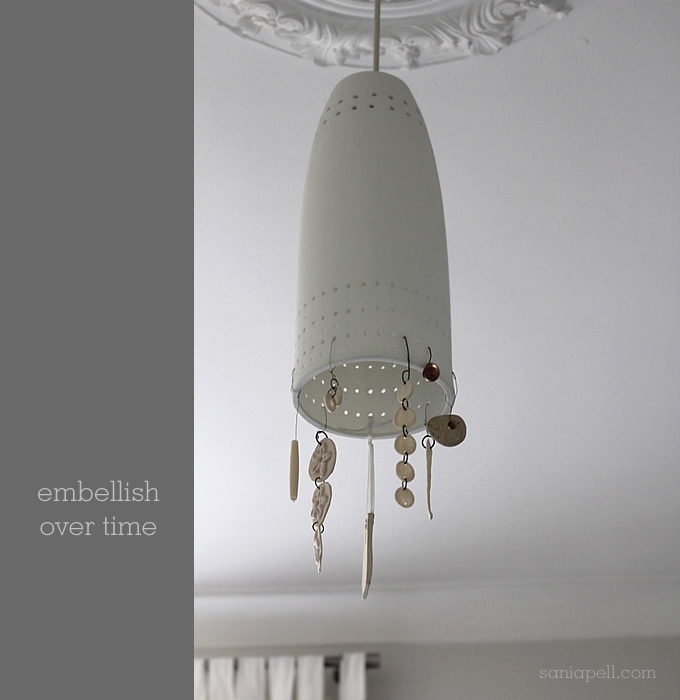 I then punched holes randomly around the bottom edge of the fabric shade then wired on a mixture of different types of clear, glass buttons and beads from VV Rouleaux – some tight to the fabric and some hanging slightly for added visual interest. It only took an hour or two to make and didn’t cost much, but it makes the shade unique and adds subtle interest to the centre of the room. And the little glass details catch the light in a delicate, sparkly way in the morning when I open the curtains to a new day. This ceiling shade hangs in my daughter’s bedroom and has been embellished and added to since she was born. It’s another shade from John Lewis that I bought years ago and is ceramic with pierced holes pierced that let light through when it is switched on. The linked ceramic discs, some with flowers on, were bought at craft fairs, a lovely glass bead and a stone with a naturally made hole found on holiday have also been added, along with an air-drying clay strip decoration that I made that hangs on white ribbon (it’s the same technique as the storage jar label project in The Homemade Home). I purposely added things of different lengths, sizes and textures in a non-uniform manner to make it more interesting and less symmetrical. 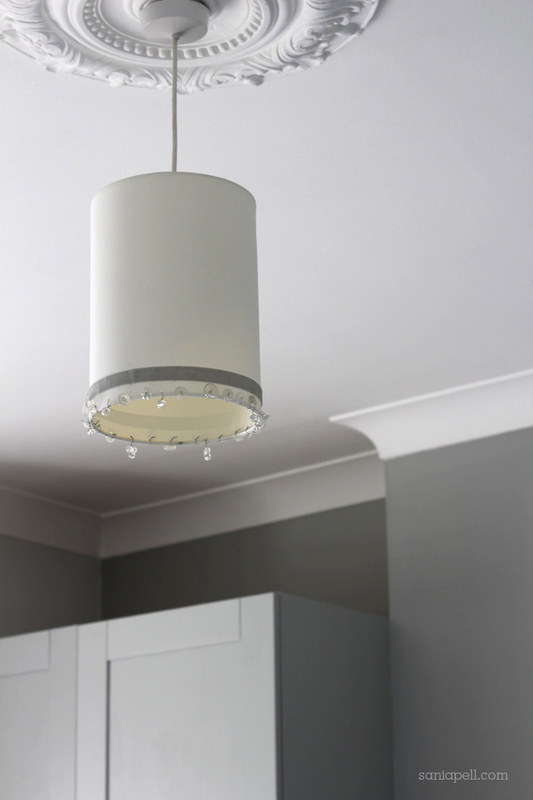 Adding little things like this is such a simple way to update a high street lampshade and help make it uniquely yours. 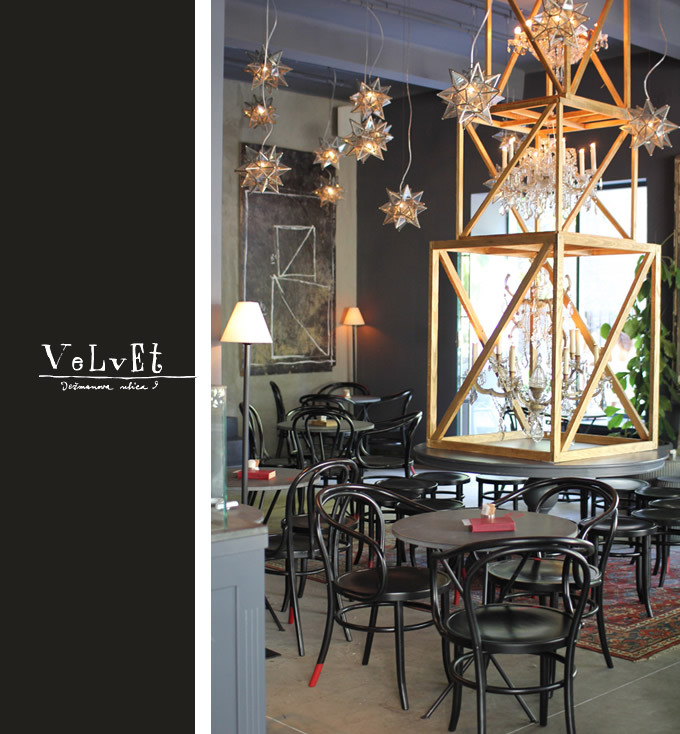 This is one of my very favourite café-bar-galleries – Velvet – on a quiet side street in the middle of the city of Zagreb. We stopped in on the way home from holiday last month for a light lunch after visiting my grandmother and before we hopped on the plane back to London. I was very kindly allowed to take a few pictures inside and wanted to share them here. 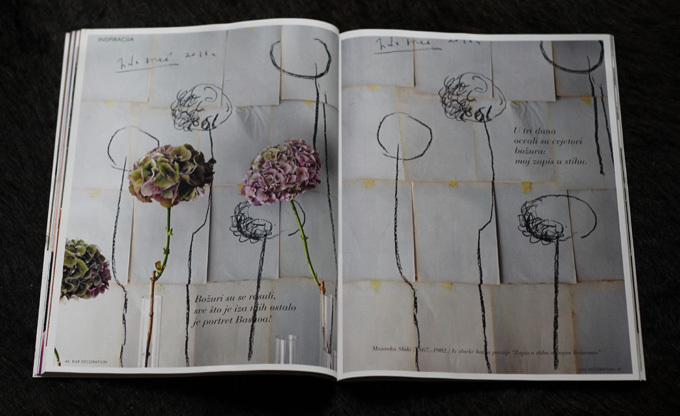 The interior is the vision of the talented Croatian contemporary artist and florist Saša Šekoranja. I met Saša briefly a couple of years ago when I had visited the original smaller café and gallery with my mother and had bought a book of his drawings as a gift for my husband. He also owns a florists near by which is like an art gallery, exhibiting the most amazing floral creations combined with his artworks. 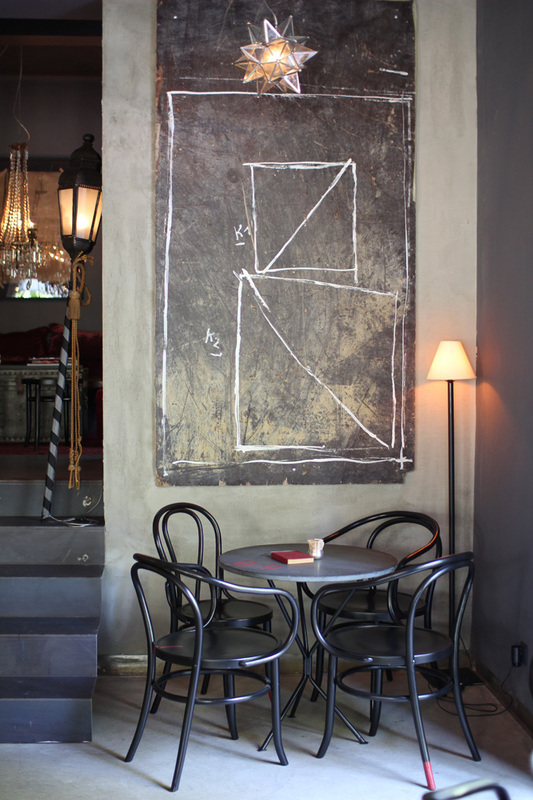 Velvet’s decor is filled with creativity, style and quirky details. I love the contrast in the centre of the room for example – a stack of ornate chandeliers boxed in plain, untreated wood resting on a big table, making an unexpected sculptural centrepiece. The café-bar has now expanded next door with a darker, more vintage feel and a delightful terrace outside. 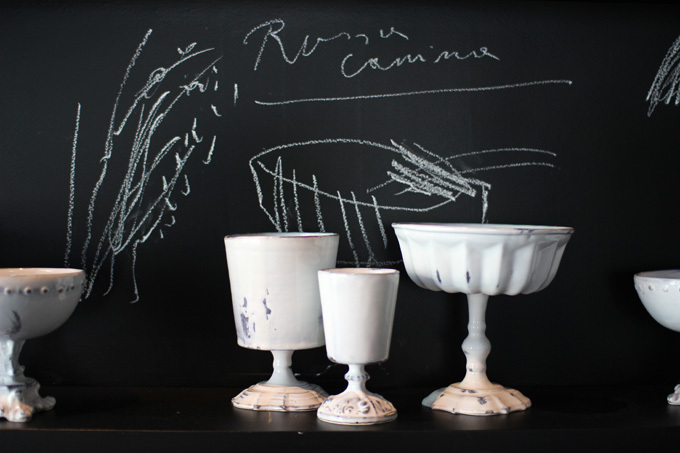 Saša’s artworks are everywhere and are beautiful, expressive, decisive and I just love his mark making – it makes the interior so individual. The smaller café’s walls are covered in frames, some filled with drawings and some left empty, ready for new pictures that he draws when he visits. 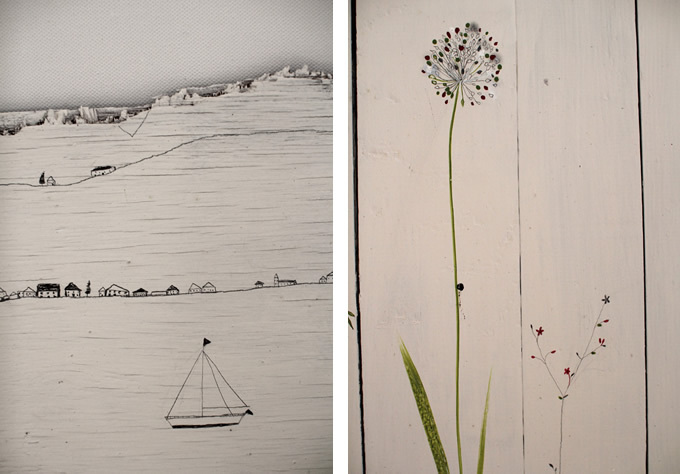 He uses a lot of aesthetic techniques that I love – simple line drawing, painted graphics, patina, texture. 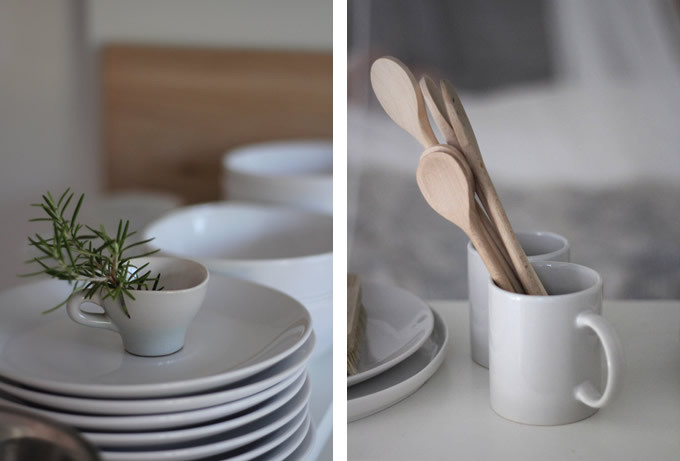 monochrome and subtle colour. It’s probably why I love it so much! 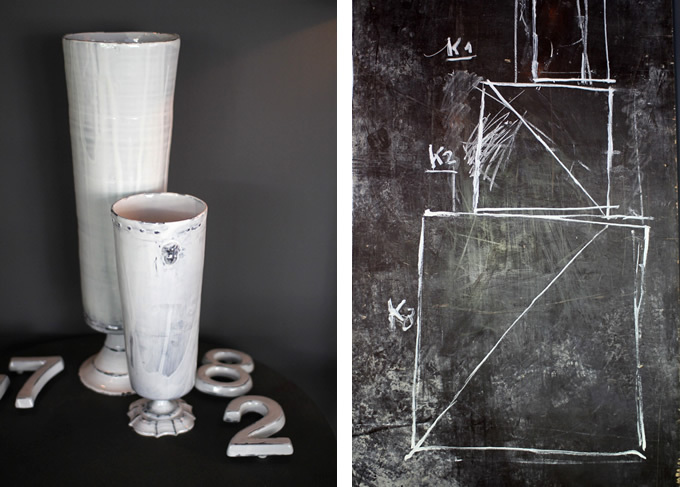 An exhibition of handmade ceramics displayed against a chalkboard wall with simple white chalk drawings mirror the geometric, monochrome paintings on other walls. 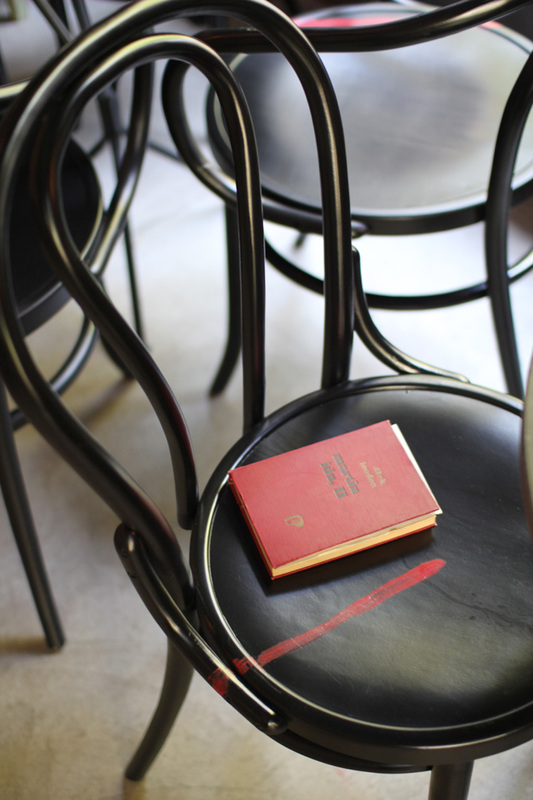 I love the use of classic black bentwood chairs, each one uniquely customised with a simple, expressive daub of red paint or the end of one chair leg dipped to match. 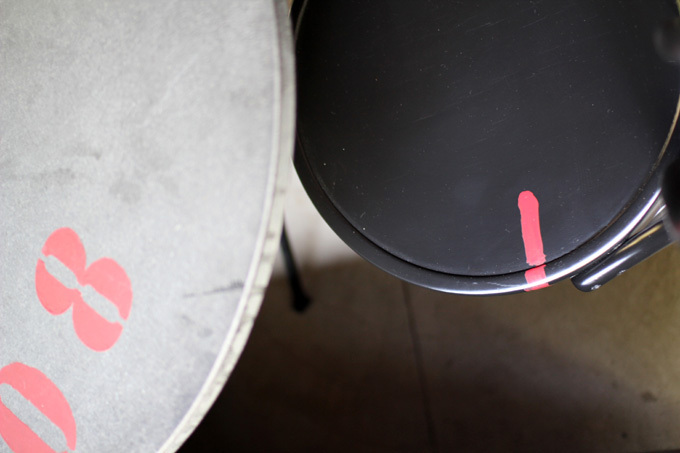 The vintage tables too have been numbered with large simple stencils all adding to the graphic effect. I love the details. 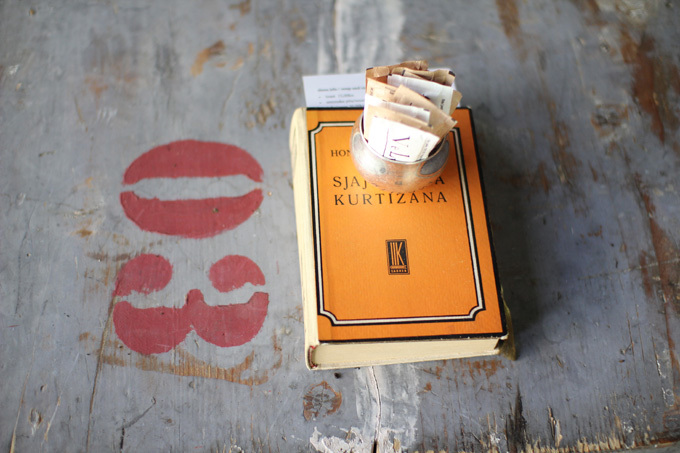 Vintage books, tied in bundles as displays and placed individually on each table with the menu stuck inside. 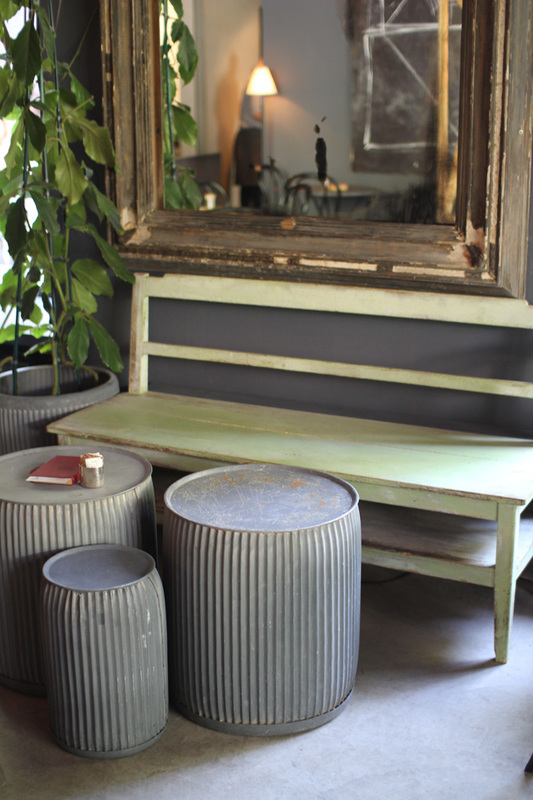 Vintage metal containers used as planters and up-ended as side tables with an old mirror and bench are typical examples of the quirky but sophisticated decor. Our lunch was simple, fresh and delicious – fresh tomato and mozzarella and Caesar salads with homemade lemonade. It’s also a great spot for people-watching, with lots of stylish locals passing by or chatting over coffee or a glass of wine. I know I’ll be stopping in again next time I am in Zagreb. 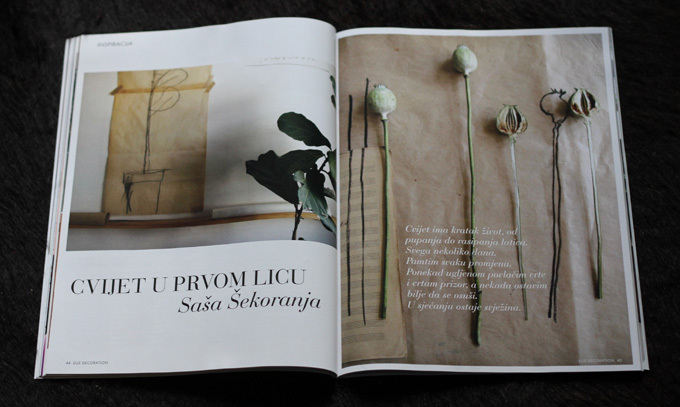 By coincidence I had been flicking through August’s Croatian Elle Decoration magazine a few days before and a four page spread immediately stood out and grabbed my eye. I then realised it was Saša’s work. Simple, natural, expressive. Just lovely. 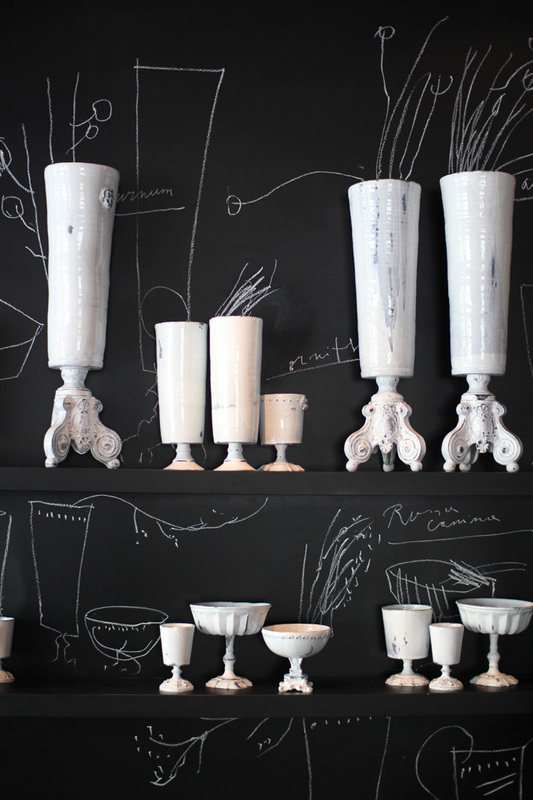 If you ever find yourself in Zagreb then I highly recommend stopping in at the florist gallery on Ilica (No. 82) then on to Velvet, just round the corner on Dezmanova Ulica. See the Velvet website for more details. Food, family, friends, art and flowers in a fabulous setting – what better way to spend some time? Sometimes I find when I’m rushing around the busy streets of London it’s easy to forget to look up. But there are visual delights up high everywhere in London – architectural features, vintage signs, statues and sculptures. I was on Oxford Street yesterday, nipping into John Lewis for some haberdashery supplies before heading on to have a look at a location house for the final shoot for my book. As I left I glanced up and remembered this wonderful sculpture that has graced the wall of their building since 1963. 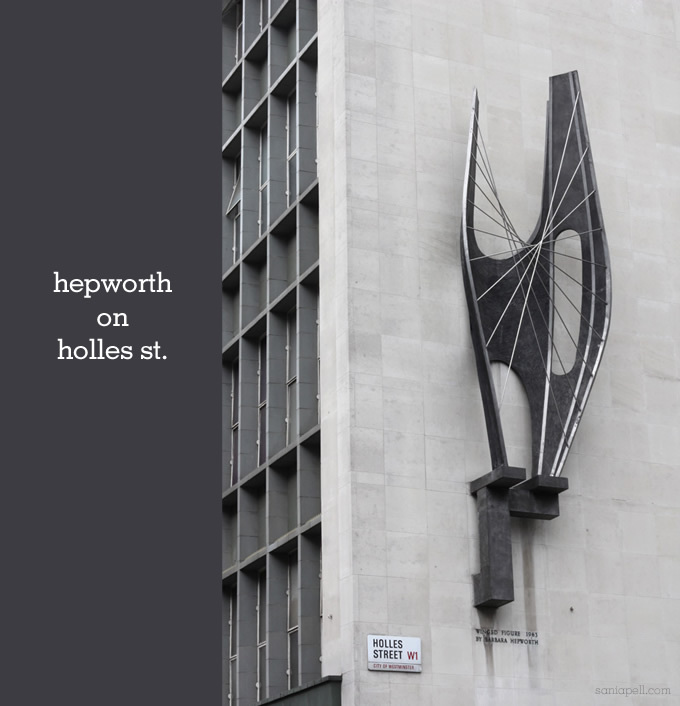 It’s called ‘Winged Figure’ and it’s by Dame Barbara Hepworth, one of my favourite artists. I had my camera so took a photo, and it reminded me of my visits to her home and studio in Cornwall. The Barbara Hepworth Museum and Sculpture Garden is one of my favourite places in the UK. I have visited a few times with my family whilst on holiday in St Ives. It’s absolutely beautiful and I could spend all day here even though it is relatively small. 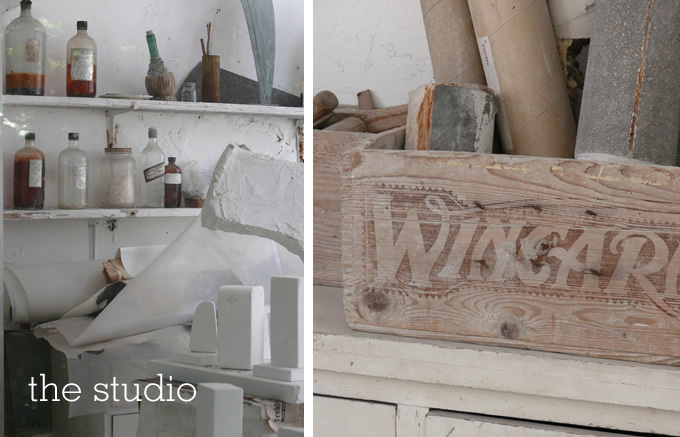 Dame Barbara’s sculpture studio has been left exactly as it was in 1975 when she died at the age of 72, with sculptures still in progress and tools lying all around. It’s run by Tate who also have the main Tate St.Ives gallery there. Both are must-sees if you are ever in the area. The sculpture garden is wonderful too. It’s raised from the street and almost feels like you have stepped into another country. My little boy said it was his favourite place we visited on our holiday, even more than the beach! 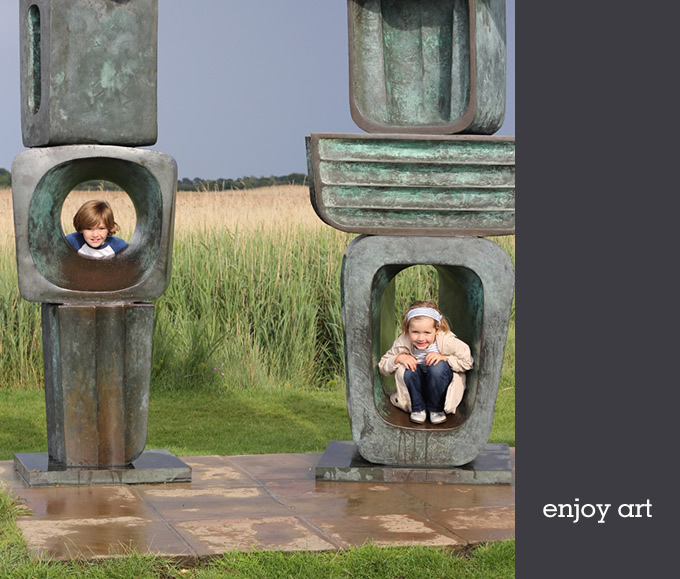 There is also a large Hepworth sculpture at Snape Maltings in Suffolk that we visited in June and my son recognised the similarity with the sculptures he loved in St.Ives. The new Hepworth Wakefield gallery opened earlier this year and looks amazing, I can’t wait to visit – a definite trip to plan for the future. And I’m sure my children will be happy to come along too! 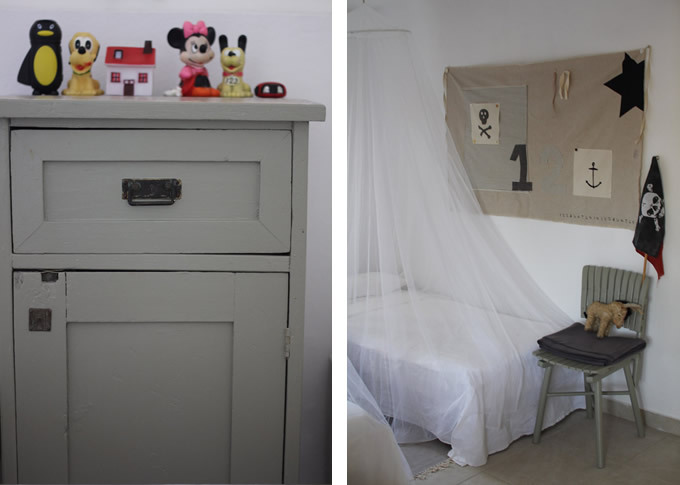 Following the lovely comments about our homemade holiday home I thought would post a few photos of some of the homemade artworks and objects that my family and I have made to display in the little house in Croatia. 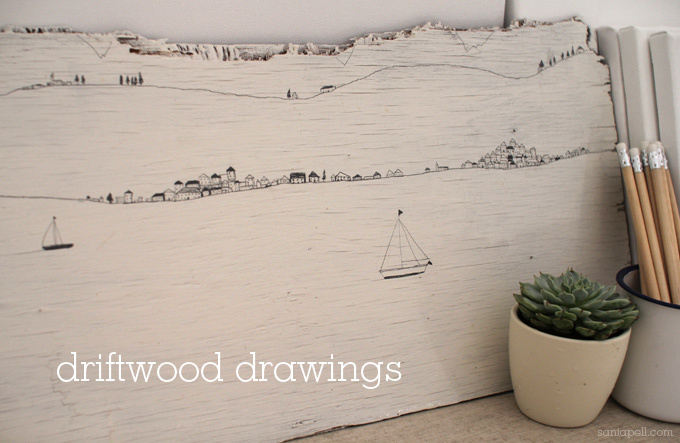 I found this old piece of plywood on the shore, and after it dried a lick of white paint meant I could draw straight onto it. It’s drawn with a simple but sharp 4B pencil whilst sitting on the beach. It’s just a nieve little drawing in my wonky style of the view from the island across the sea to the mainland, with the jagged edge of the broken wood becoming the mountains in the distance on the horizon. I drew this picture for my mum. 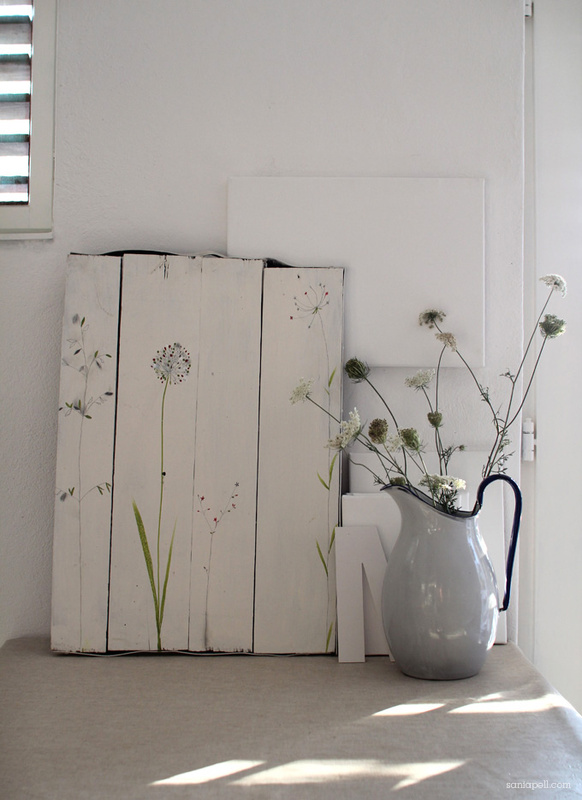 We found an old discarded wooden panel on a walk on the island and brought it home and I thought it would make an interesting canvas after I painted it white. I picked some wild flowers from the garden and drew and painted them in a simplistic style. I’ve called these toys but they’re really for display only. The fun is in collecting the wood and making them. My little boy and my father made these together. 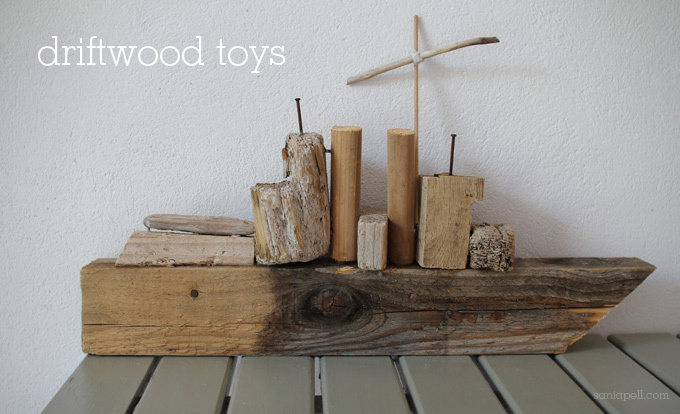 My son (he was six at the time) and husband had been out foraging for interesting bits of driftwood around the shoreline and he and his grandfather nailed and glued them all together, creating different things from the shapes that had been found. 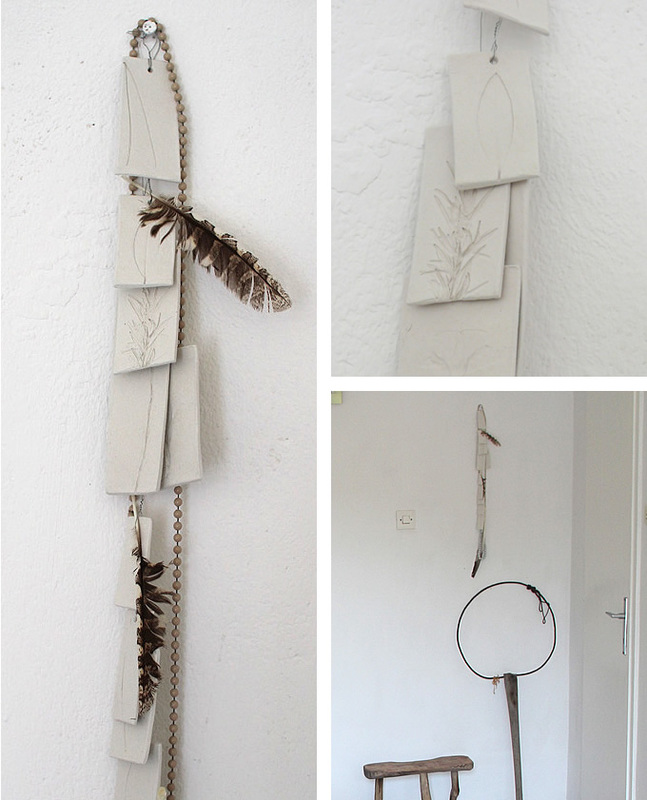 This wall hanging was made from rectangles of rolled Das air-hardening clay, pressed with leaves picked from the garden, and wired together. 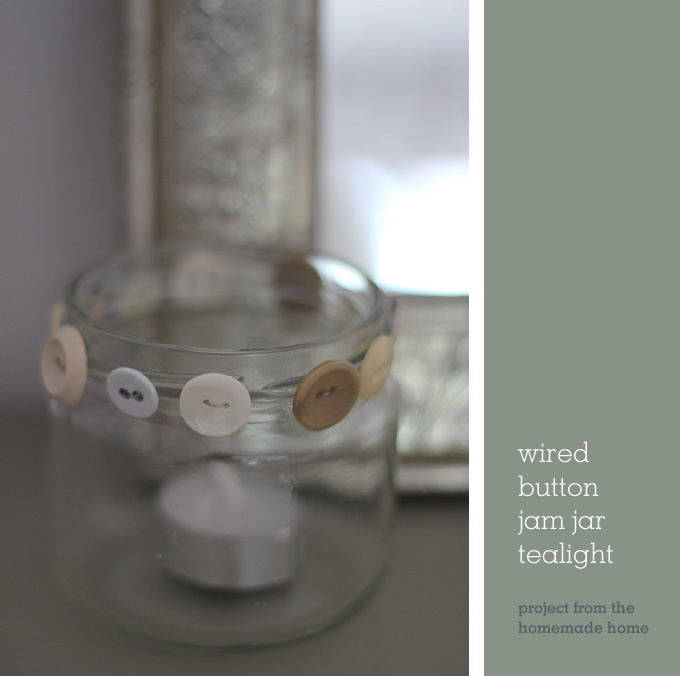 They’re made in the same way as the storage jar labels project on page 15 of my book if you want to try it at home. The vintage beads were my grandmother’s and the feathers my children found in the garden and pushed into the wire loops. It hangs above an old driftwood fishing net that was found washed ashore – though the net had long since disintegrated– and a vintage Croatian milking stool. 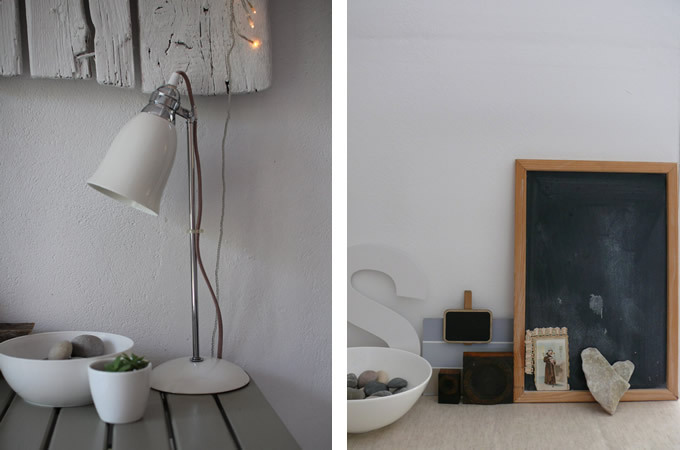 Just a few little things to display in our holiday home that cost virtually nothing but mean everything to my family, and help our little house feel like home. My Croatian grandfather built my family’s holiday house himself almost 50 years ago. The original one-room bungalow was extended little by little as the family grew and we now stay in what was once the old car garage, built at the end of the land. It had a shower room and tiny kitchenette in one corner but it was home to spiders and old, dusty furniture. 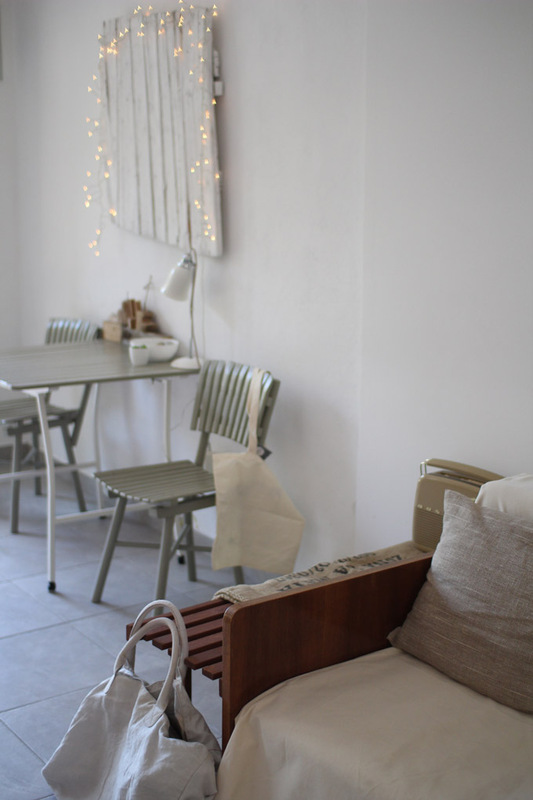 A couple of years ago my mother gave my brother and I the challenge (all be it a very pleasant one) of transforming it into a space that is a joy to stay in for our families. There is very little to buy on the island itself and choice is limited on the mainland near us too, so make do and mend and recycling have played a large part on how we have approached the transformation. 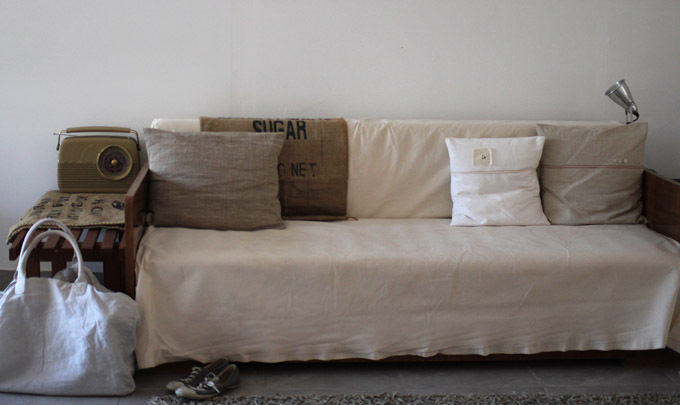 People keep their furniture and pass it on, so there are no flea markets or junk shops and we have had to be inventive. I thought I would share some photos I took this summer as it shows how you can decorate when choice is limited and you are on a small budget. 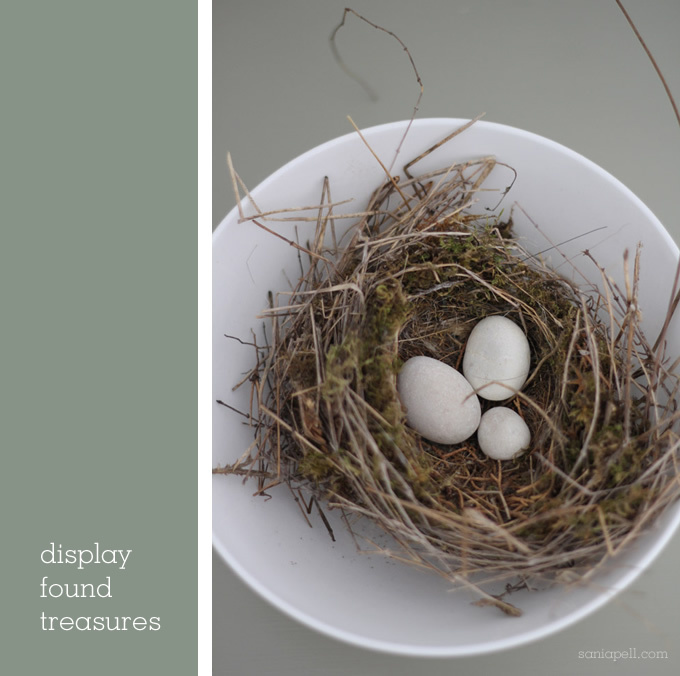 It combines all of my loves – homemade, upcycled, vintage finds, family art and found treasures – alongside new items carefully selected from supermarkets, DIY stores and the high street. My grandparents used these slatted chairs and table for as long as I can remember and we sat around it for dinner when I was little. I discovered this summer that they were originally salvaged by my grandfather in the 1960s from a restaurant of a friend on the island who was throwing them out. The friend’s granddaughter is a friend of mine from the island who also returns each summer and our children now play together. 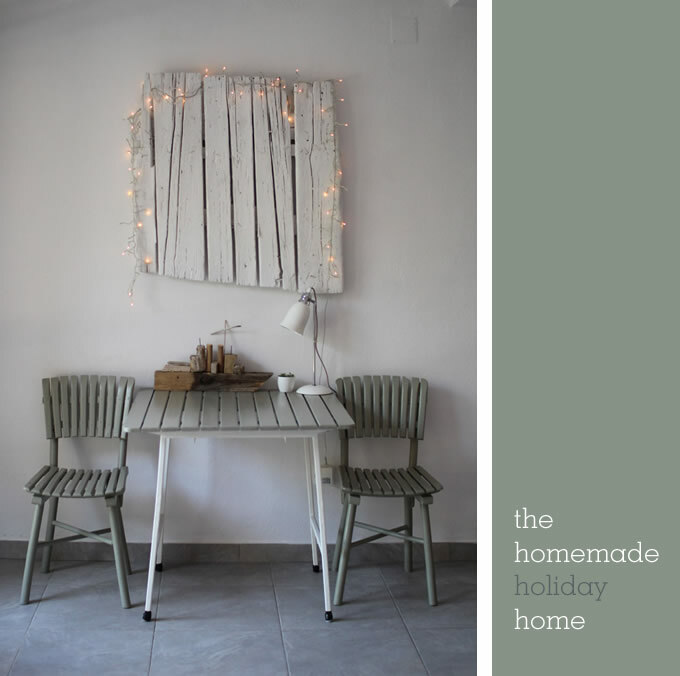 We screwed the rickety old chairs back together and painted them in a pale greeny-grey eau de nil, I love the colour and have painted any available furniture the same shade. This is so it all mixes and matches and means we can move things around to suit our needs. The panel on the wall is driftwood, fished out of the sea while out on a walk. I let it dry out, painted it with white emulsion paint and hung it on the wall to add some texture and character. I draped it with fairy lights which look beautiful at night. I love their twinkle in the evening and how the slats mirror the table below it. I brought this simple porcelain table light over from England after I found it in the B&Q sale. 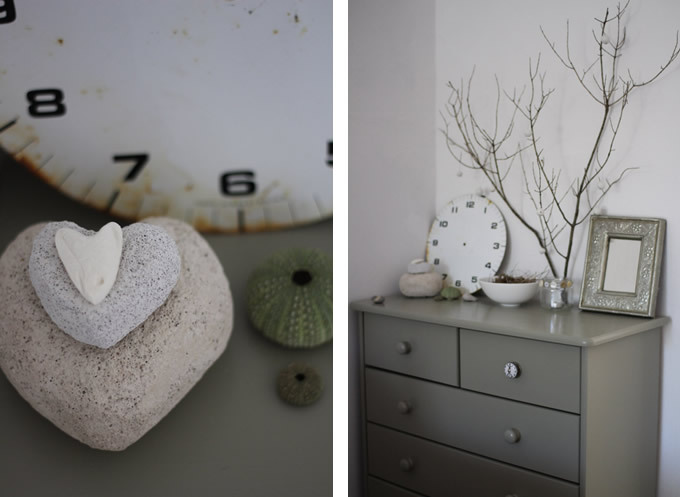 Pebbles from the beach, succulents from the garden and other little objects all make it feel like home. The sofa-bed above is a relic from the past but with no easy way of replacing it, I simply covered it with a large piece of cheap canvas and tucked in the sides, although I have been meaning to buy upholstery pins to keep the fabric in place.The cushions are variations of ones that I made in The Homemade Home. They are simple envelope style covers in complementary, natural shades of linen and hessian with buttons and ribbon as decoration. I took measurements of the old cushion pads one year and then made covers back at home before returning. 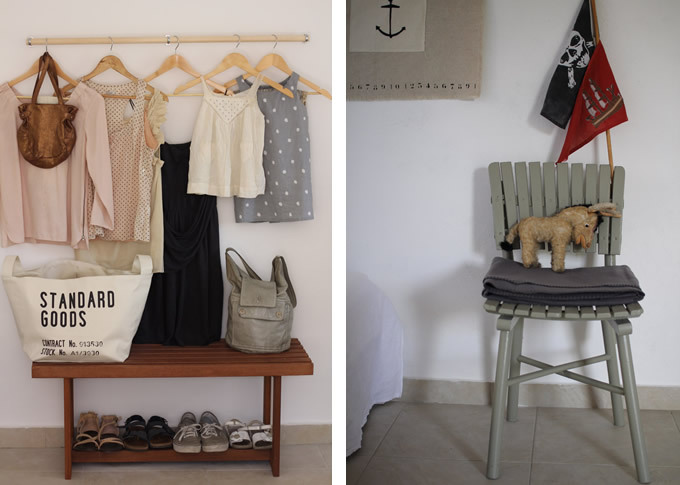 The grain sacks were car boot sale buys and the linen beach bag is from Zara Home that I took out with me in my luggage. 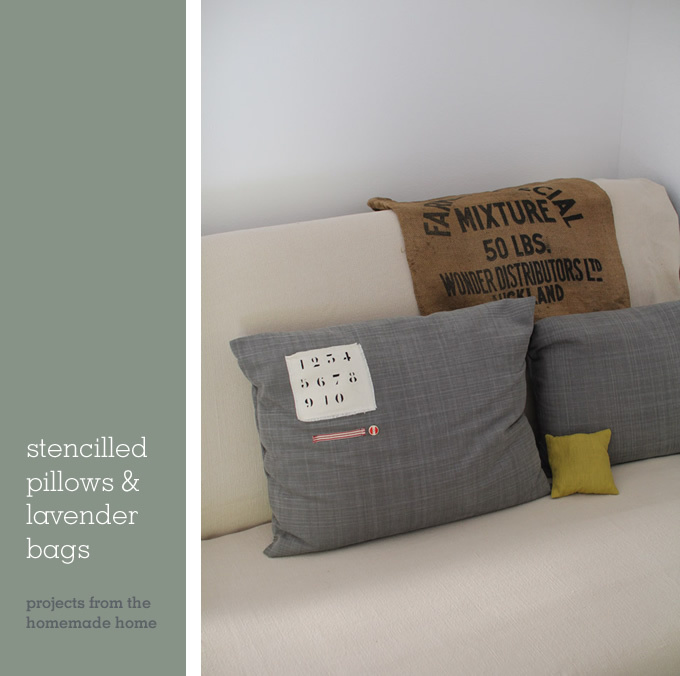 To make cushions and lavender bags like these see the projects in my book, which have step-by-step instructions and illustrations. The main room above used to be the car garage and the room through the door is the old water cistern. As there was no mains water, all the houses had huge concrete boxes to store rain water collected over winter which would then supply you with water over the summer months. When the house was connected to the new water supply, the old water tank became unnecessary so we knocked through and made a new room with a terrace. 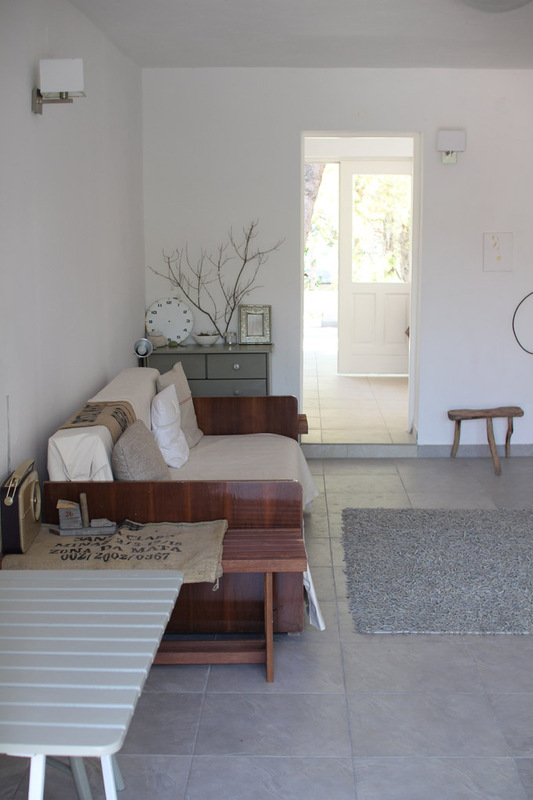 My brother and husband white-washed throughout and we had the floor inside and out tiled in basic pale grey. These heart-shaped stones are made from discarded porous building blocks that had washed to shore, shaped into hearts by my children and husband by rubbing them on the rocks. The small white one is a cuttle fish bone and fashioned in the same way. I painted this cheap, pine drawer unit the same green and added a handle that I had bought in Anthrolopolgie in London and brought over with me, along with one of my car boot sale purchases – an old clock face! The branch is from the garden and I made little beads from air-drying clay to hang from the branches. This is a variation of the wired button vases project from The Homemade Home that I made from an old jar whilst I was out there. Above is a display that we love. My little boy found an old bird’s nest that had fallen out of a tree (no eggs or birds in sight). We put it in a bowl and he ran to the beach and found three little, smooth pebbles that look like eggs! 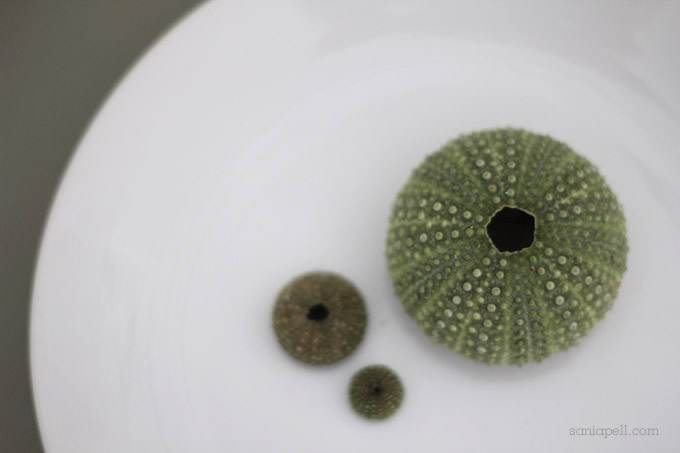 The green objects below are sea urchin skeletons, so fragile and delicate in colour, that my family found whilst snorkelling. The kitchen area is old and minimal (we hope to replace it next year when a new Ikea opens in Zagreb) and there is a large shelving unit that we moved to divide it from the bedroom area in the main room. As our choice was limited and things were going to be on display I chose simple, classic, neutral items that would all sit together and blend with the overall room. 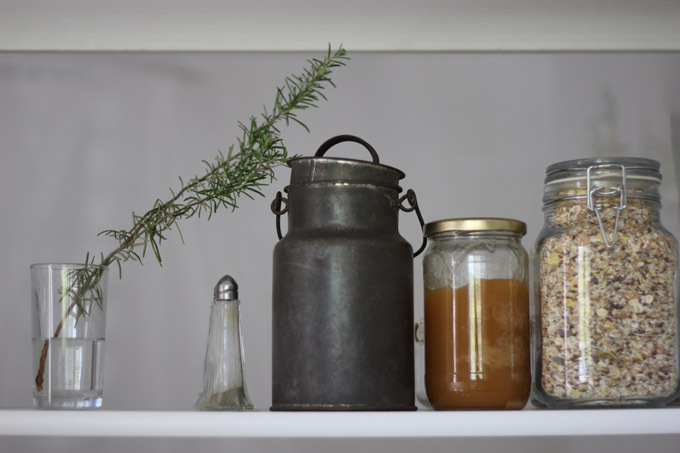 Plain white china, clear glasses, kilner jars, stainless steel and natural wood utensils. We got them all on day trips to the mainland by just being selective from the local big supermarkets and home stores like Konzum, Pevec and Baumax. 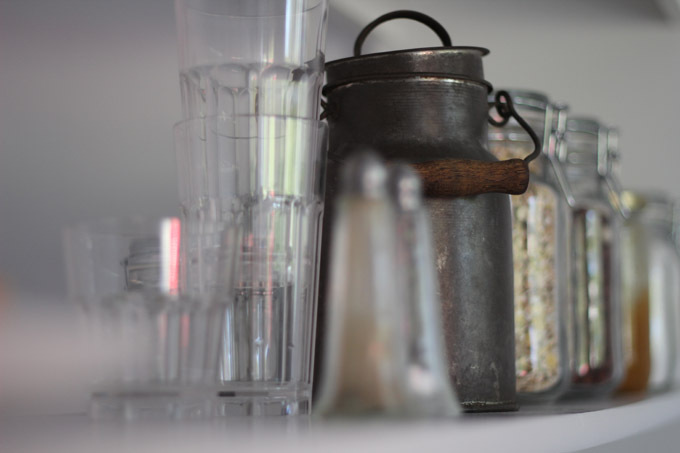 The vintage metal milk pail was my grandmother’s. 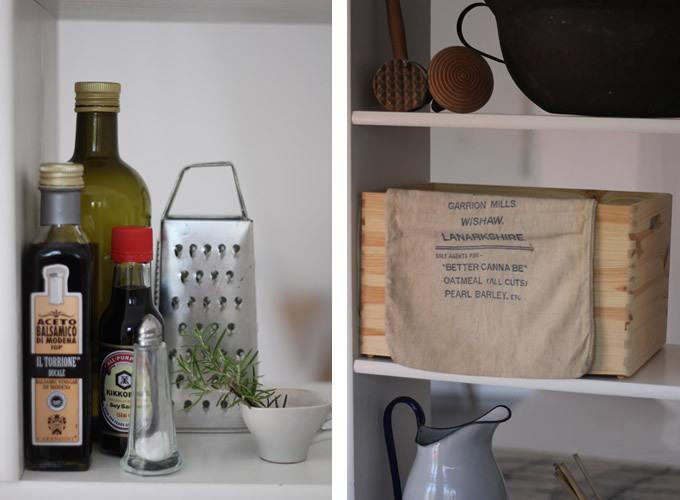 Making displays from simple everyday items means you know where things are. I chose nice bottles and packaging and we found simple pine wood boxes which are perfect for storing art materials and other things. 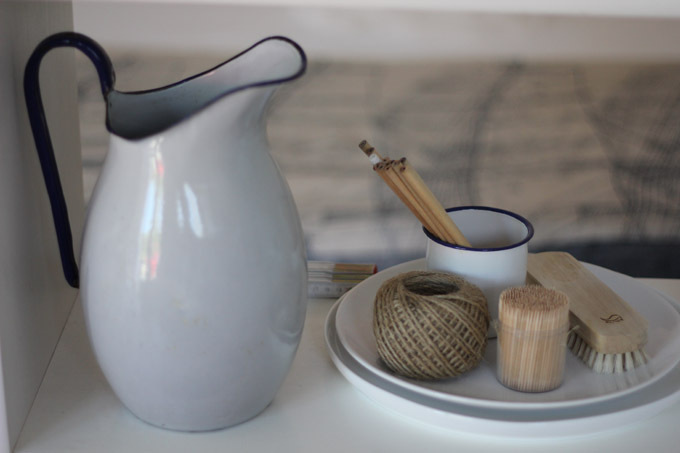 The vintage enamel jug and mug are more finds from my grandmother. 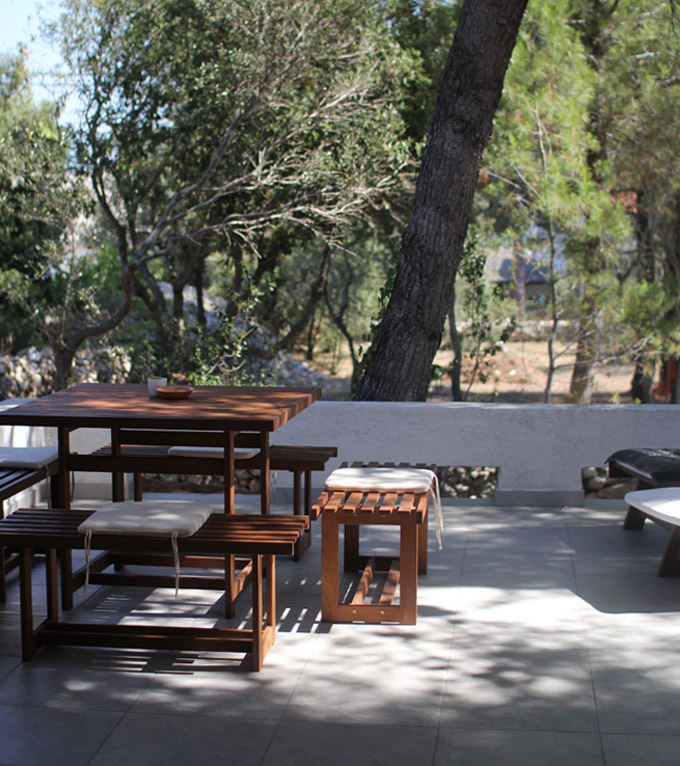 For the new terrace we managed to find some contemporary wooden furniture in a DIY store that we liked and that was really good value. I bought the vintage-look graphic towels from H&M Home and took them over. You can also see walls made by my grandfather from the hundreds of rocks that were cleared from the ground before it could be used. This is common here and the island is covered in these rock walls that help divide the plots of land. 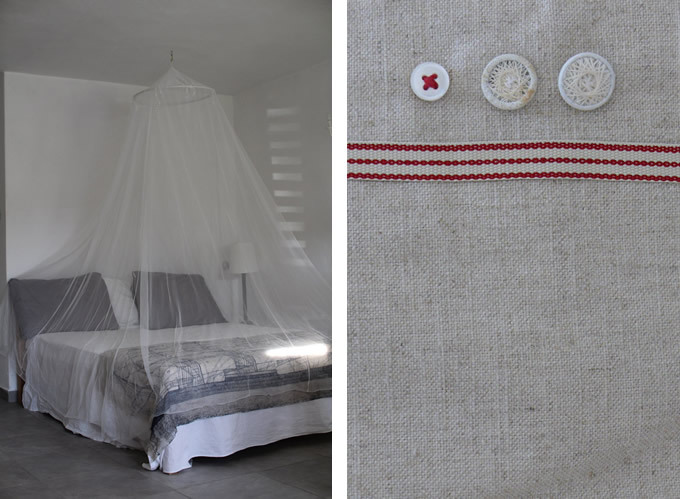 In the bedroom area the mosquito net works on a practical level, stopping the mozzies from nibbling us while we sleep, but also acts as a soft curtain around the bed helping divide it from the main living area. 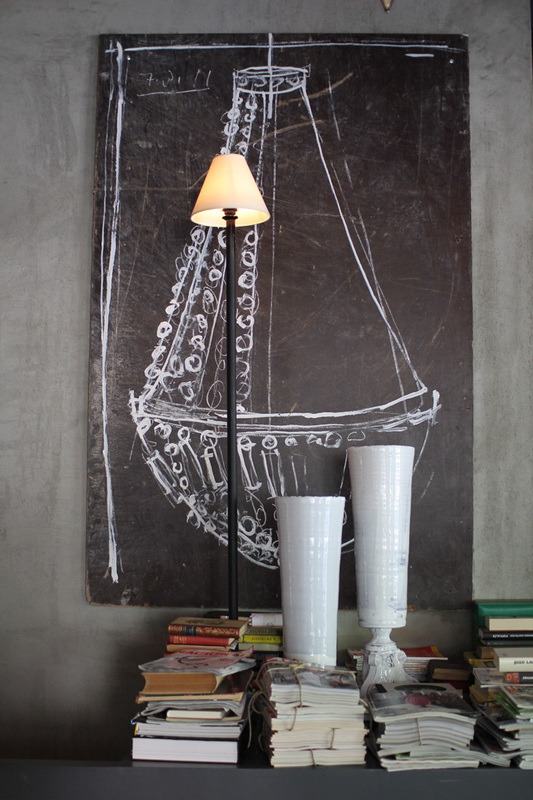 I found the linen throw, printed with an old drawing of a ship, in Anthropologie and couldn’t resist it. We have struggled to find wardrobes, so this year we simply put a broom handle on the wall to hang clothes. Two of my favourite handbags are in this shot, both by Ally Capellino that I bought at her fabulous sample sales. The Standard Goods bag is used for storage and was bought from H&M Home. The little vintage donkey was given to my daughter by a kind lady at a little bric-a-brac market in Zadar last year when she showed a penchant for it. 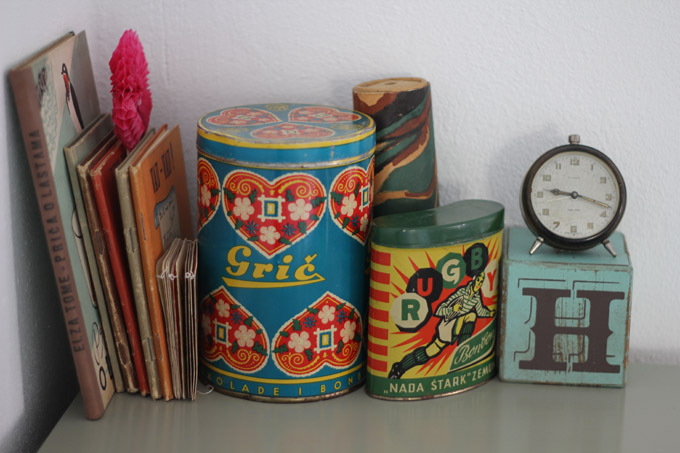 This collection of books and tins all came from my grandmother’s apartment in Zagreb, that my mother found when she was tidying up there. There were some very old sweets still in the tin! The tube at the back is my mother’s old kaleidoscope from when she was a child and the little clock is one that sat upon her desk when she was studying. This old cabinet was found discarded on the side of the road, fixed up by husband and given a lick of paint in my favourite colour and decorated with plastic vintage characters and wind up children’s torches (the penguin and ladybird). I made the banner hanging on the wall to decorate the children’s room with a nautical theme. The base fabric is linen and the shapes had fusible web ironed on to the reverse of the fabric and were then cut out and ironed into place. The evening activity usually involves a stroll around the town harbour eating ice creams from the best ice cream parlour in the world – well according to my children it is! They love to collect the paper umbrellas and flowers and display them in their bedroom. The old garage is now a sweet little place to stay but it will take a few more years to make it our own, little by little each summer. But that is part of the fun and it is now enjoyed by three generations of my family. I think my grandfather would love what we have done and love that the place he created for his family to enjoy is loved and enjoyed by his great-grandchildren too. It’s a true homemade holiday home.